The U.S. bank prime loan rate was unchanged in the first half of November, remaining at 3.25 percent. All of the credit card offers tracked by this survey were also unchanged in early November, though economic developments during the period offer hints about what may be next for credit cards. The first full week of November saw two key economic data releases. The backdrop for these releases was that they would provide some of the first clues as to what impact the federal government shutdown had made on the economy -- both in the weeks leading up to the shutdown, and during October when the shutdown actually occurred. Surprisingly, the latest data suggested that the economy fared quite well despite the disruption. On Nov. 7, the Bureau of Economic Analysis released an advance estimate of gross domestic product (GDP) showing a real annual growth rate of 2.8 percent during the third quarter of 2013. While not spectacular, a 2.8 percent growth rate was an improvement over the prior quarter's 2.5 percent growth rate, and represents the third consecutive quarter in which GDP growth improved. Advance estimates of GDP growth need to be taken with a little bit of a grain of salt, since they are subject to two subsequent revisions (these will be made at the end of November and the end of December). For the time being though, the decent showing for GDP growth helped allay fears that the economy had put on the brakes in anticipation of the government shutdown and the debt ceiling deadline. This positive view was reinforced by the Nov. 8 release of the Bureau of Labor Statistics' Employment Situation report for October. This showed that 204,000 new jobs were created even while the government shutdown was going on, a figure which is better than the 190,000 average of the prior 12 months. 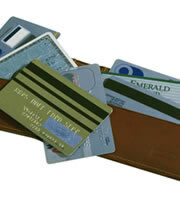 An improving economy can have a mixed impact on credit card rates. Interest rates generally are expected to move higher as the economy strengthens, but with credit cards this can be countered somewhat by improving credit confidence. Credit card rates did not fall as much as many other interest rates during the weaker phase of this cycle, and so they may not rise as much as the economy strengthens. With no change in any of the consumer credit card offers tracked by this survey, the spread between rates for rewards credit cards and non-rewards credit cards remained at 2.16 percent. That is one of the lowest such spreads of the last three years, which somewhat reduces the potential cost of participating in a rewards program. Student credit card offers were unchanged in the first half of November, making this the fourth consecutive semi-monthly survey in which those rates held steady. In terms of credit card rates, business credit cards have been the most stable of three major markets tracked by this survey (consumer, student and business credit cards). That trend continued in early November as rates on both business rewards and non-rewards cards remained unchanged. With no change to any of the credit card offers tracked by this survey, the spread between rates for customers with excellent credit and those for customers with average credit remained unchanged at 3.93 percent. This spread is an indication of how much customers can reduce their credit card rates by improving their credit histories. 0 Responses to "Credit card rates remain steady despite economic developments"